To create the top 20 for our 25th annual rankings, Fortune and its survey partners at Hay Group asked 3,322 executives, directors, and securities analysts to select the 10 companies they admire most. Having fresh ideas and being green are among the qualities that distinguish this year's winners. 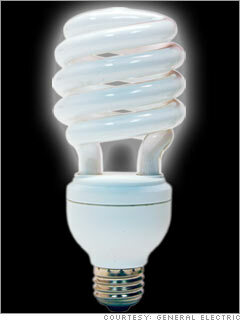 Compact fluorescent lamps like GE's use 75% less power than regular bulbs. GE's much-publicized "Ecomagination" campaign is aimed at supercharging revenues while doubling its $700 million R&D budget to come up with solar-energy hybrid locomotives, lower-emission aircraft engines, more efficient lighting, and ever more sophisticated water-purification systems. Evidently conservation begins at home: GE cut its own energy bills by about $70 million last year, partly by installing new lighting in more than 100 of its plants, and reduced its greenhouse-gas emissions by about 150,000 tons. And for sheer adaptability over time, GE is hard to beat. Of the 12 companies Charles Dow chose to make up his original Dow Jones industrial average in 1896, GE is the only one still in the index. More: See how GE rates in 8 key areas. Blog: What do you think of the top 20 Most Admired Companies?